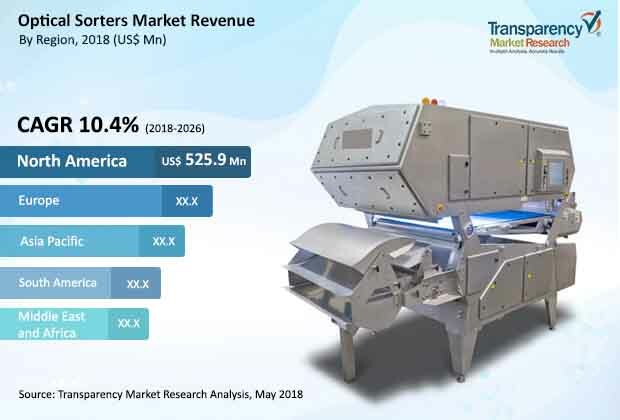 According to a new market report published by Transparency Market Research titled Optical Sorters Market the optical sorters market is expected to reach US$ 3,350.2 Mn by 2026. The market is projected to expand at a CAGR of 10.4% from 2018 to 2026. According to the report, the optical sorters market is expected to be influenced by a range of factors such as cost reduction and increase in productivity through automation, growing labor costs, and stringent government regulations pertaining to food safety. Additionally, market players are focused on research and development to enable development of innovative and technologically advanced optical sorting solutions. Some of the majorly used technologies include Near Infra-Red (NIR) spectroscopy, fluorescent lighting and lasers, X-rays, and cameras. These technologically advanced optical sorters detect and remove the smallest foreign materials (FM) and defects, and automate the operation lines. Further, in the near future, optical sorters are expected to adopt more sophisticated algorithms which can allow them to better understand and process the information collected from sensors. In terms of component, the optical sorters market is bifurcated into products and services. The services segment is further classified into consulting, repair and maintenance, and training. Products segment is anticipated to witness a significant CAGR growth rate. Nonetheless, hardware prices of optical sorters are projected to decrease over the forecast period. Consulting, and repair and maintenance services segments are estimated to expand at a significant CAGR of more than 11% during the forecast period. Substantial growth in adoption of advisory services provided by market players to evaluate the current operational processes of clients is pushing the revenues from the consulting services segment. North America is expected to hold substantial share of the global optical sorters market during the forecast period. Expansion of the market in the region is primarily due to the stringent government regulations pertaining to food safety especially in the U.S., significant mergers and acquisitions in the region, and significant growth in adoption of optical sorters in waste recycling facilities. Effective analysis and food sorting equipment have a huge role to play in brand and consumer protection. In the past, many companies experienced food-related recalls due to issues related to contaminations. In the U.S., the FDA Food Safety Modernization Act (FSMA), defines the FDA mandates, oversight tools, and authority to establish modern food safety standards for those who process, grow, store, and transport food. In June 2017, Penn Waste, Inc., a Pennsylvania, U.S.-based commercial and residential waste recycling and removal services provider, introduced NRT MetalDirector and NRT optical sorters in its materials recovery facility (MRF). The new system integration will improve output material purity and throughput to more than 45 tph (tons per hour). The Optical Sorters Market report provides analysis of the optical sorters market for the period 2016 to 2026, wherein the years from 2018 to 2026 is the forecast period, 2017 is considered as the base year, and data for 2016 has been provided as historical information. The report covers all the trends and technologies playing a major role in the expansion of the optical sorters market during the forecast period. It highlights the drivers, restraints, and opportunities expected to influence the expansion of the market during this period. The study provides a holistic perspective on the expansion of the market, in terms of revenue (in US$ Mn) and volume (Units), across different geographical regions, namely, North America, Europe, Asia Pacific, Middle East & Africa, and South America. The report highlights the key trends affecting the market on a global scale. Furthermore, region-wise, prominent countries/regions covered in the report include the U.S, Canada, Germany, France, the U.K, India, China, Australia, GCC countries, South Africa, and Brazil. This report analyzes and forecasts the optical sorters market at the global and regional level. The market has been forecasted based on revenue (US$ Mn) and volume (Units) from 2018 to 2026. The study includes drivers and restraints of the global optical sorters market. It also covers the impact of these drivers and restraints during the forecast period. The study encompasses market attractiveness analysis, wherein component, type, end-use, and countries/regions are benchmarked based on their market size, growth rate, and general attractiveness. This research study on the global optical sorters market provides a detailed cross-segment and cross-country analysis based on the different segments including component, type, and end-use. Based on component, the optical sorters market is segmented into products and services. By type, the market is divided into camera, laser, NIR, X-ray, combined, and others. In terms of end-use, the optical sorters market is classified into food processing, tobacco processing, waste recycling, mining and others. Furthermore, based on region, the market is divided into North America, Europe, Asia Pacific, Middle East & Africa, and South America. Secondary research sources that are typically referred to include, but are not limited to, company websites, annual reports, financial reports, broker reports, investor presentations, and SEC filings, internal and external proprietary databases, and relevant patent and regulatory databases, national government documents, statistical databases, and market reports, news articles, press releases, and webcasts specific to companies operating in the market, national government documents, statistical databases, and market reports, Factiva, etc. The report highlights well-established players operating in the market including TOMRA Systems ASA, Buhler AG, Satake Corporation, Key Technology, and Cimbria. These key players are looking to capture larger market share by expanding their current optical sorters offerings in emerging economies. For instance, in May 2018, Satake Corporation launched FMSR Series optical sorters in Brazil for a wide range of applications. Two models, FMSR03-L (3 chutes) and FMSR02-L (2 chutes) use RGB technology to remove unwanted products, including irregular-shape defects and discoloration from small products such as coffee beans.